• Screen: 6.3-Inch Large Screen OLED Display (QHD-Plus).. Resolution: 2960 x 1440 Pixels, 523 ppi.. 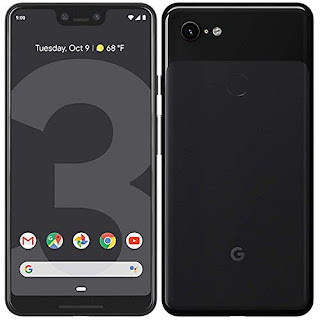 Type: 3D Corning Gorilla Glass, Amoled Touchscreen..
• Storage Capacity: 4-Gigabyte Random-Access Memory (RAM)..
64/128 Gigabytes Read-Only Memory (ROM)..
• OS Platform: Google Android 9.0 Pie Operating System..
• Processor: Qualcomm Snapdragon 845 CPU..
64-Bit Octa Core (2.5GHZ plus 1.6GHZ)..
8MP(x2) Double Selfie/Face Chat Cameras (Lens: f/1.8/2.2, 75/97° Wide Angle)..
12.2MP Back Camera with Electronic/Optical Image Stabilization, Dual Pixel Phase Autofocus, Flicker Sensor..
Google Search Lens for looking up anything online via camera..
• Network Bands: 4G FDD-LTE / 3G / 2G..
• Wireless Connectivity: 2.4GHz+5.0GHz Wi-Fi 802.11a/b/g/n/ac, 5.0 Bluetooth®.. Supports Type-C USB Data Connection/Transfer..
• Power Capacity: 3430mAh Long Lasting Battery..
• IP68 Splash/Water Resistant and Dust Proof..
• Audio/Sound: Stereo Speakers with Microphone and earphones..
• Dimensions: 6.22 x 3.02 x 0.31 inches, 184 grams..